Champions Cup, Ulster v Clermont at the KIngspan Stadium, Belfast. Ulster's Charles Piutau celebrates with Tommy Bowe, Paddy Jackson and Ruan Pienaar. Photo: Darren Kidd / Press Eye. 10 December 2016 - Picture by Darren Kidd / Press Eye. Champions Cup, Ulster v Clermont at the KIngspan Stadium, Belfast. CharlesÊPiutau goes over for Ulster's 5th try of the match. 10 December 2016 - Picture by Darren Kidd / Press Eye. 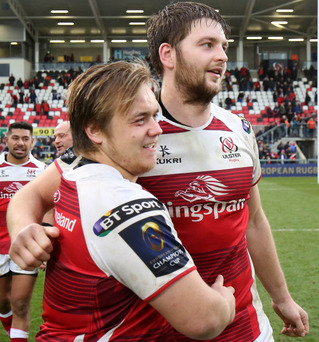 Champions Cup, Ulster v Clermont at the KIngspan Stadium, Belfast.